A two-person exhibition of sculptures by Sarah Bednarek and paintings by Nichole van Beek will be featured at SCCC's Flecker Gallery from February 9 – March 7, 2017. 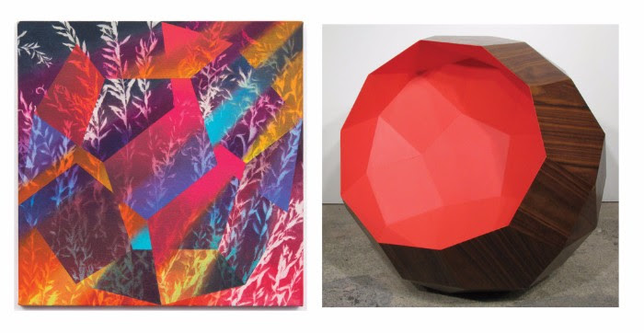 Nichole van Beek, “No Skins, Hides, or Bones”, 2016, acrylic on dyed canvas, 20 x 20 inches and Sarah Bednarek, “Concave Sibling”, 2016,mdf, walnut veneer, paint, 30 x 30 x 30 inches. Pivotal Axes sets the stage for a dialogue between two artists who are largely concerned with form, geometry, and the abstract, but also who also believe that these concerns carry meaning that has social and political implications. This is a thought provoking exhibition; a collection of exquisitely made objects and images that call into question the role of the hand-made and the individual in a time of extreme consumerism, as well as the role of perception in an age where truth is increasingly elusive. These artists works are imbued with subtle elements and clues, revealing themselves fully only to the sensitive viewer engaging in slow, thoughtful, and contemplative ways of seeing. Nichole van Beek earned her BFA from The Cooper Union in 1998 and her MFA from The University of California, Santa Barbara in 2007. She is represented by Jeff Bailey Gallery in Hudson, NY and has exhibited work at Geoffrey Young Gallery (Great Barrington, MA), Morgan Lehman Gallery (New York, NY), Interstitial (Seattle, WA), and Ortega y Gasset and The Parlour Bushwick in Brooklyn, among other spaces. In 2016 she received a Pollock-Krasner Foundation grant to attend the Vermont Studio Center. She was also the recipient of a New York Foundation for the Arts grant in painting in 2012, and in 2011 she participated in Socrates Sculpture Park Emerging Artist Fellowship. She has taught in the Intensive English Program at Pratt Institute since 2012. She lives and works in Queens, NY. Sarah Bednarek earned her BFA from the University of Minnesota in 2002 and her MFA from the Sculpture and Extended Media program at Virginia Commonwealth University in 2005. Her exhibition record includes solo, curated, and group shows, both nationally and internationally with recent shows at the Thomas Hunter Project Space, Hunter College (New York, NY), ADA Gallery (Richmond, VA), ruSalon (Brooklyn, NY), Yashar Gallery (Brooklyn, NY), The Parlor (Brooklyn, NY), Zurcher Gallery (New York, NY), and Mulherin + Pollard (New York, NY). She has received awards and scholarships in support of her art including recent residencies at Hunter College, and the Sculpture Space Residency (Utica, NY). Bednarek is a cancer survivor and lives and works in Brooklyn, NY. The exhibition will feature a full-color catalog with an essay by NewYork-based artist and critic Karen Schiff, as well as an extended dialogue conducted by both artists. Please contact the gallery for directions, to schedule an appointment, or to request a catalog. Subject: LongIsland.com - Your Name sent you Article details of "SCCC Flecker Gallery Exhibit: Pivotal Axes - Form, Geometry, and the Abstract, Feb. 9 - March 7"